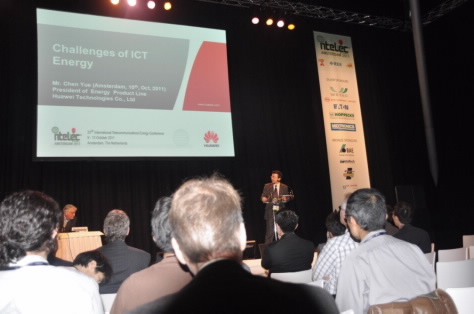 Amsterdam, Netherlands, 12 Oct, 2011: Huawei, a leading global information and communications technology (ICT) solutions provider, showcased a series of green energy solutions with high efficiency in ICT sector at the INTELEC 2011 conference. These solutions aim to address the challenges operators are facing in ICT energy sector and enhance their understanding of network energy. 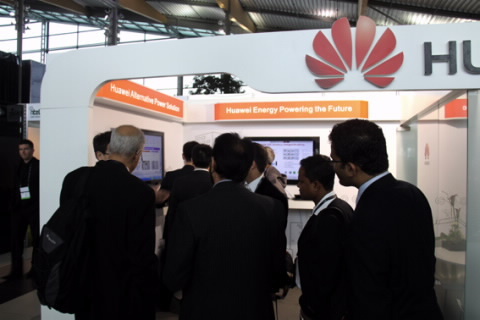 As the only main sponsor of INTELEC 2011, Huawei has presented solutions for various scenarios, such as PowerCube solutions in off-grid areas which can save fuel by more than 50% with new technologies, and high-efficiency power solutions in stable grid areas which can effect considerable energy savings with the adoption of advanced technologies. These advanced solutions have attracted a lot of interest from operators. Chen Yue, vice President of Huawei Energy and Infrastructure Product Line, was invited to deliver the keynote speech in which he said-“Huawei has achieved high efficiency conversion & utilization of energy by integrating information control technologies in network and energy systems in the industry field, which paves a brand new road for energy saving and emission reduction in the ICT sector”. His speech was highly appreciated by the experts attending the conference. INTELEC is the most influential global conference in the telecommunication energy industry. The 33rd INTELEC conference is being held in Amsterdam during 9-13 October 2011. Huawei is the main sponsor and showcases its solutions on solar energy, generator evolution, as well as its internal and external power source solutions to share the innovative technical solutions and visions in the telecommunication energy industry.